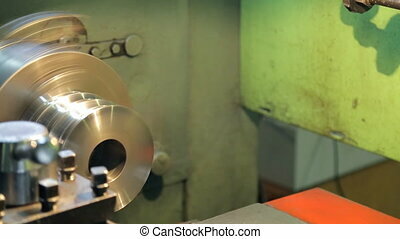 A Worker Polishes A Shiny Metallic Rotating Part On A Lathe. 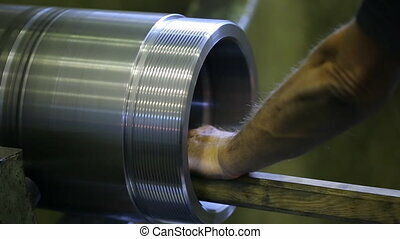 A worker polishes a shiny metallic rotating part on a lathe. Polishing is used to reduce surface roughness of product. With help of polishing to obtain mirror surface, high precision and beautiful presentation of product. 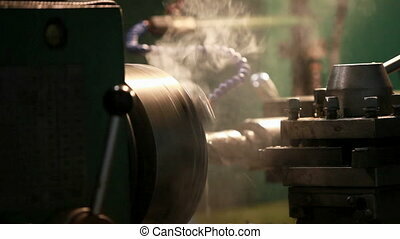 On lathes polishing is done with sandpaper or sanding belt. Sanding belt, emery cloth, sandpaper is paper-based and rag, of different granularity. In this case, employee secured a grinding material on a wooden bar. 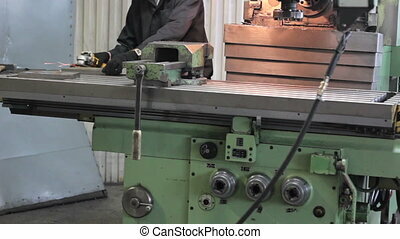 Worker on a machine lathe in factory. Machining process in the factory. 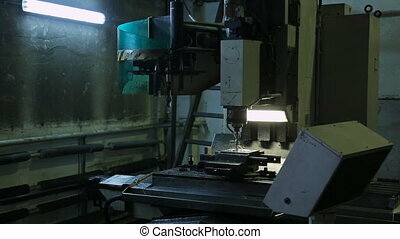 CNC drilling machine on a factory. 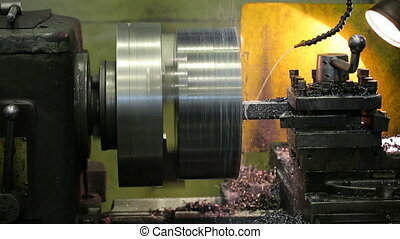 Worker on a machine metal lathe in factory. Machining process in the factory. 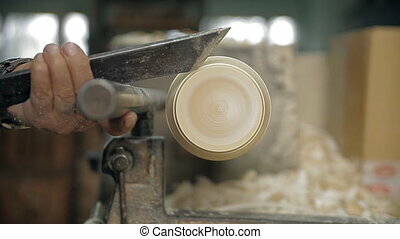 A craftsman holds a chisel and handles a rotating work piece on the machine. Sawdust is flying, you can hear a loud noise. In the end matreshka is made - a national Russian toy. Mechanic polishing a screw on industrial polishing machine in a garage. 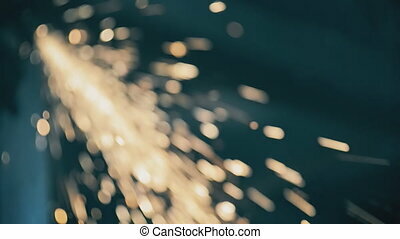 Sparks come out from grinding wheel. Parts from engine, gearbox are on the table. 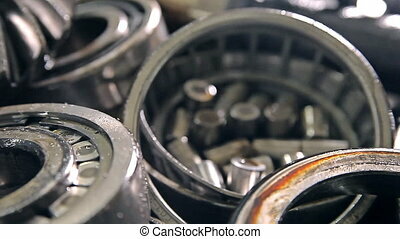 There are gears, bearings and other rotating elements. Some of them are in oil. horizontal milling machine for cutting aluminum ingots with a large drill bit cutter in the center rotates the workpiece and a huge drill in a hole of a given diameter ingots, coolant poured inside to reduce the temperature of the metal, and the lamp lights up for better access to the review process of manufacturing the necessary parts and quality control. modern machine for the production of a plurality of steel, aluminum, bronze, soft and hard ferrite alloys. The focus is specifically designed for background sites or use in presentations or solutions ready for installation of video reportage. 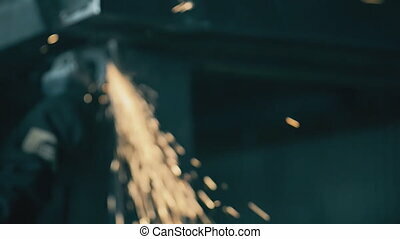 Video sawing machine metallic area, creating a huge amount of sparks and the end of the clip stops. 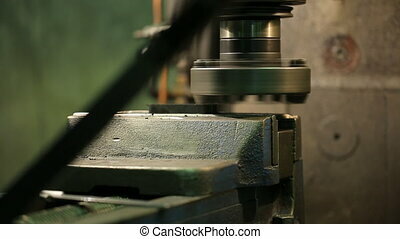 Worker at metal grinds workpiece on a horizontal milling machine. 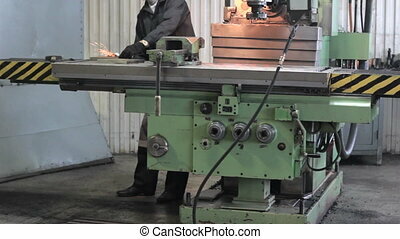 Worker man in a plaid shirt works as a machine operator at plant, workshop for production of metal parts. 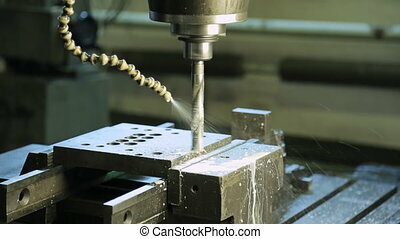 His duty to grind the various parts on an automatic milling machine. Hamstrung detail slowly passes beneath milling cutter, a cutting tool that gently removes layer of metal. In process, from under it takes off fine shavings. Unit itself is old and covered in oil. 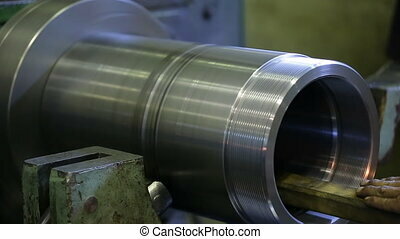 At factory the cylinder is processed quickly on a horizontal lathe. The blank receives a powerful rotation of the spindle. At a result of the circular recess is formed on the outer surface details. In the foreground is lever for regulating the clamping. Walls plant workshop of green. Equipment is intended for the treatment of surfaces of solids of revolution, and is widely used in various industries. 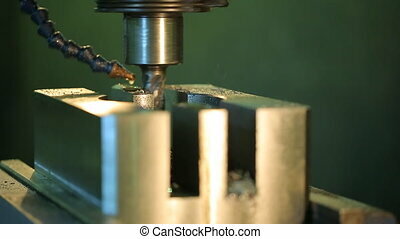 Drilling metal shiny parts on a horizontal milling machine with coolant. Drilling-milling machine is used generally for drilling blind and through holes in solid materials, and also for reaming, countersinking, reaming, tapping threads. 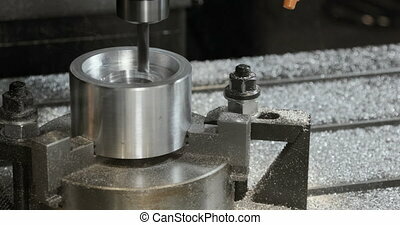 Drill is static and not moving with great speed to spin the workpiece clamped in the spindle. Of special tube, dripping coolant on drill bit to cool it and thereby improving its efficiency, you can See how thin and shiny chips out of drilled holes. 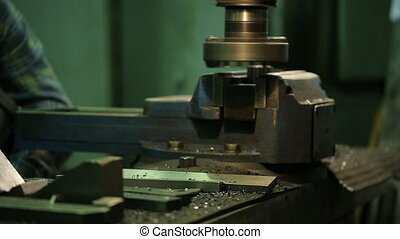 Process of machining metal parts on a vertical milling machine. A vertically disposed spindle, which in some models allows displacement along its axis and rotating around a horizontal axis, thereby expanding technological capabilities of the machine. Mandrel for vertical machines is a flange with taper standard or more modern cone with one hand. If you want to install a disc mill, is used as a mandrel horizontally on machine, and on horizontal machines. Rotating circular metal blank in a milling machine with CNC, closeup. Tightly secured with a golden shimmer, brass detail, a quick spin on spindle of automatic lathe. Constructive features of milling machining center center has a stationary base frame and a movable console, which is quite often fixed equipment to perform drilling, milling, grinding operations. This device provides hard clamping of workpiece, increase machining accuracy, reduces level of vibration of machine during operation. Hairy arms of a middle-aged worker holding a wooden block with sandpaper for machining metal parts on a running machine. 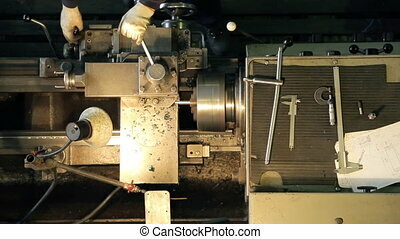 Worker using means at hand performs task of grinding and polishing metal parts inside. This part is attached to machine which spins brilliant metallic of piece. A worker holds wooden block on end of which is secured sandpaper. He carefully enters inside this which polishes surface of parts inside. Diameter of this workpiece is quite large and with one hand on end is threaded. 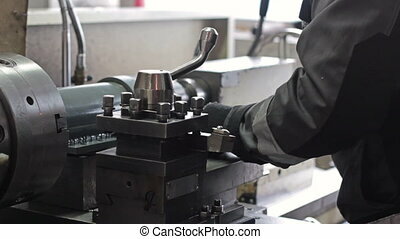 Factory worker sets metal piece in vise of a milling machine. 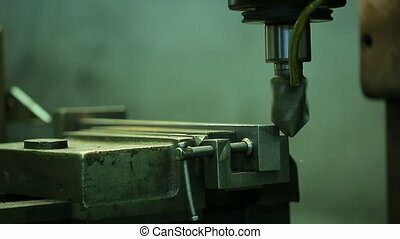 Male worker in a plaid shirt and wear protective gloves when using tool loosens grip mount, that would put a new blank on a horizontal milling machine for metal. He gently inserts a brilliant detail, tightly tamp it in a vise and squeezes mechanism. Then it measures distance using a vernier caliper, and satisfied with result, starts to bring workpiece under cutter. 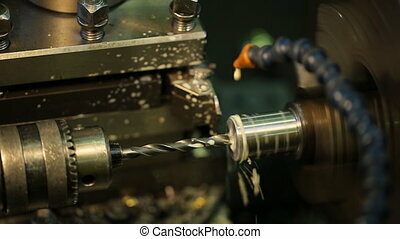 Process of grinding metal parts end mill on a horizontal machine. 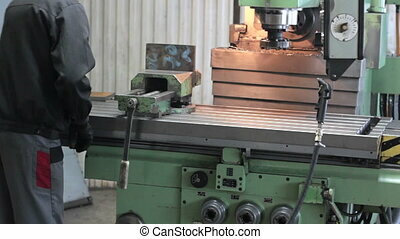 In milling machines main motion is rotation of cutter and feed motion relative movement of workpiece and cutter. Milling machines designed for machining with a cutter of flat and profiled surfaces, metal and other workpieces. Cutter, mounted in spindle of a milling machine rotates workpiece mounted on table makes a move of filing a straight or curved sometimes carried out simultaneously a rotating tool. 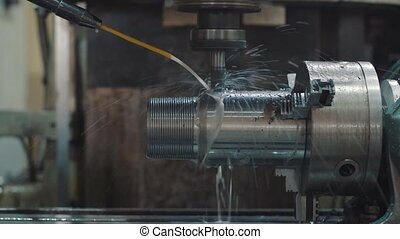 Process of removing rusty metal layer on a rotating workpiece milling machine and turning in a brilliant surface with drops of coolant. 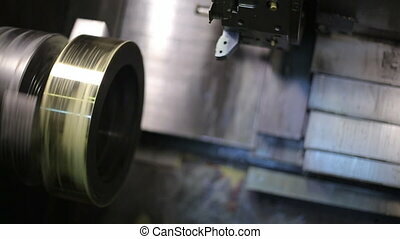 Gradually blade of machine removes rough and dark metal layer, leaving a smooth shiny cylindrical part. Use a hose with a coolant supply that blade did not heat up. Vertically milling machine designed for machining of flat and shaped surfaces of workpieces in conditions of medium and small batch production and in production of products, repair shops. horizontal modern milling machine for cutting steel, aluminum, bronze, soft and hard ferrite alloys, ingots with a large drill bit cutter in the center rotates the workpiece and a huge drill in a hole of a given diameter ingots, coolant poured inside to reduce the temperature of the metal, and the lamp lights up for better access to the review process of manufacturing the necessary parts and quality control. 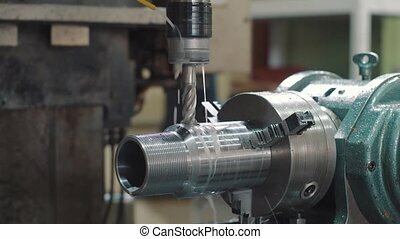 A running CNC machine with a rotating drill and a pipe for cutting fluid. To reduce friction of tool on wall of hole drilling is carried out with a supply of cutting fluid, especially when machining steel and aluminum workpieces. Cast iron, brass and bronze blanks can be drilled without cooling. Cooling when drilling lowers temperature of drill that is powered by heat of cutting and friction on walls of holes reduces friction of drill on these walls and, finally, contributes to chip removal. 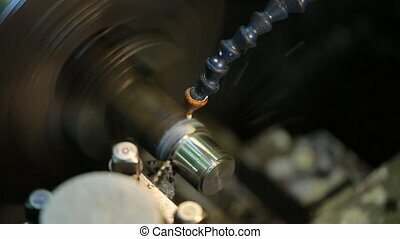 Rotating a drill a vertical drill press handles metal piece with a coolant drop by drop. Amount of coolant supplied to cutting zone, varies from a few liters per minute, depending on type of machine and working diameter. Specialized drilling and boring machines are designed to perform a specific handling, or for obtaining any specific types of surfaces in a given range of dimensions on parts of one or different technological classes. 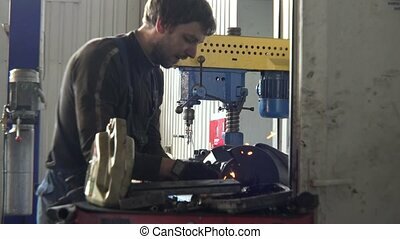 Man worker polishing metal part inside machine tool. 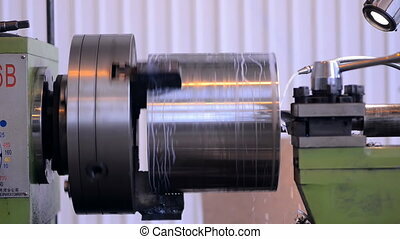 A large metal piece rotates at high speed, it is fixed to machine spindle. A worker with bare hairy arms holding the bar at end of which is fixed sandpaper. 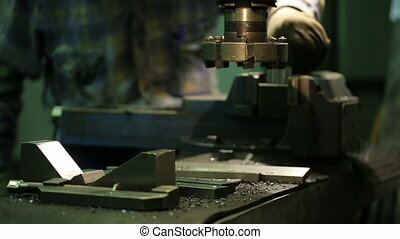 He introduces him into workpiece and grinds surface on inside. She is already beginning to shine and sparkle clean metallic sheen. This is quite a dangerous method, requiring machine operator accuracy and smooth movements. Running a milling machine with CNC and a flow of cutting fluid. Milling machines with numerical control can be classified according to different criteria. Consider design of vertical milling CNC machine. It consists of such elements as frame is designed for mounting of all components and mechanisms of machine. Desk can be moved in longitudinal and transverse directions along guide rails. Remote control, or CNC strut mounted on a bracket and can be moved at a convenient operator position. 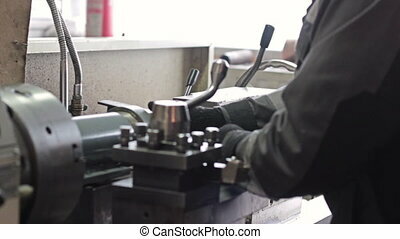 Worker with gloves to adjust the lathe when manufacturing parts. Master moves with the lever of the mechanism for the precise execution of the work assignment, which is performed in the workshop of the plant. The process covers a small lamp. Metal shavings after treatment falls apart. Nearby are the tools to measure the details: calipers, micrometer. On the platform of the machine are blueprints which produces professional products.